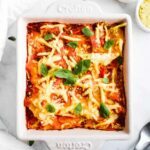 Vegan tomato & courgette lasagne that will blow you away. This Italian classic is absolutely packed to the brim with flavour. Moreover, it’s also a super healthy take on traditional lasagne. It contains 2 portions of vegetables and is rich in vitamins, minerals and protein. Who said vegans only eat salad? 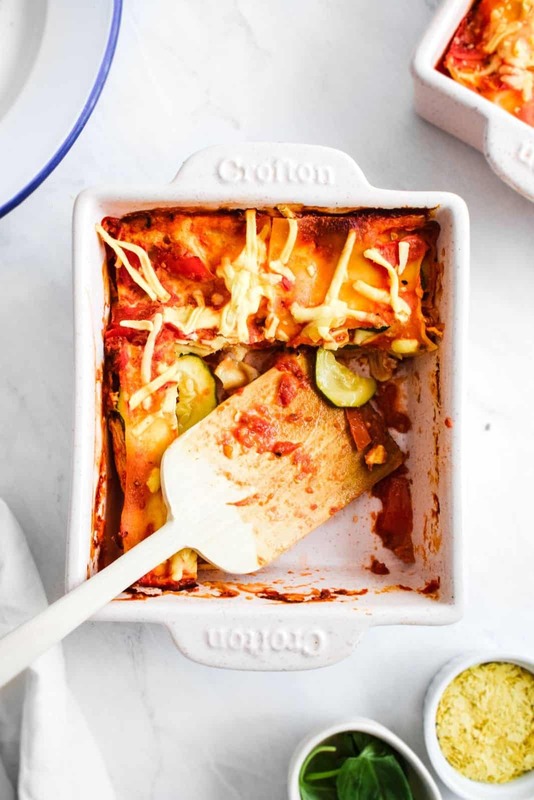 This vegan tomato & courgette lasagne is here to prove them wrong. 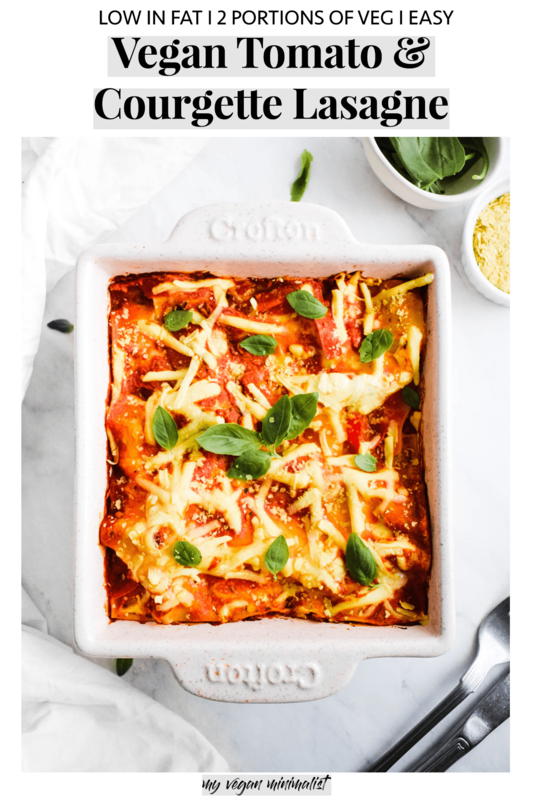 I’ve been inspired to make this vegan tomato & courgette lasagne during my many trips to Italy. Whetherer it was enjoying gelato during a school trip to Venice, exploring vegan pizza options in Verona or discovering freshly made pasta in Cinque Terre, Italy never failed to thrill my inner foodie. I’ve stayed true to the classics like courgette and tomato, while playing around with new vegan favourites like nutritional yeast and vegan cheese. I’d like to think my fascination with Italian cuisine has something to do with my mum. She’s an extraordinary cook (hi mum! she’s an avid reader of this blog) and a huge inspiration behind many of my recipes. (I recently shared her decades old, tried and tested vegan jam recipe). And, as it happens, many of her favourite dishes are traditional Italian classics like tomato pasta, mushroom risotto and homemade pizza. Making lasagne from scratch essentially involves 2 sauces – red and white sauce. Red sauce is extremely straightforward and easy to make. Just gently fry some onions, tomato, pasata, add some good Italian herbs and you’re good to go. However, I’ve seen many of my friends completely intimidated by the prospect of making their own white sauce. I’m here to make sure that doesn’t happen! The first step involves combining 3 basic ingredients – cornflour, nutritional yeast and seasoning. Once you’ve combined your dry ingredients in a bowl, you will need to add liquid. I found almond milk works best, although you could play around with any UNSWEETENED dairy alternative. One of the most important things is to avoid clumps. You can do that by adding your liquid very, very slowly and stirring vigirously using a metal whisk. You will be left with a thin mixture, which can then be warmed up. Make sure to warm it up slowly and keep stirring to avoid clumps. If your mixture is too sticky, slowly add more liquid (water or almond milk). After just a few minutes, your mixture will start getting thicker and become sticky. This is the perfect moment to take it off heat and get ready to build those pasta layers! If you’re feeling stuck with your white sauce or any other aspect of the lasagne, get in touch via the comments below. I’ll be happy to help you out! Alternatively, you can always message me on Instagram if you happen to have any questions about my recipes. Can lasagne be healthy? Veggie-packed and super low in fat! As mentioned above, a portion of my vegan lasagne contains 2 servings of vegetables. If you’re looking to add in some extra veg, I wholeheartedly recommend sweetcorn. It’s one of my favourites and you can simple sprinkle it in between the layers. Alternatively, you could also add sliced mushrooms or aubergine. The white sauce is also predominately based on another healthy ingredient – nutritional yeast. This vegan classic is rich in vitamins B and is an excellent source of other vitamins, minerals and even protein. You’ve probably noticed that my vegan lasagne doesn’t require any fat other than a small drizzle of olive oil you will need to gently fry the vegetables. 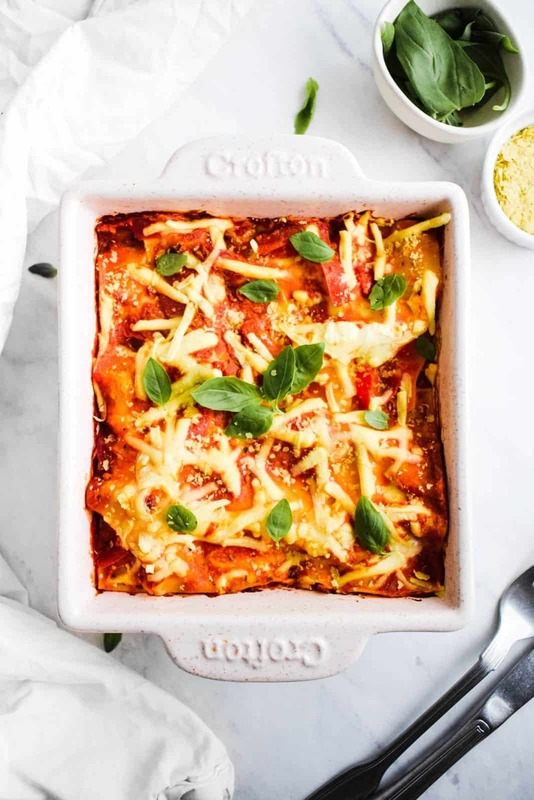 Last but not least, the generous sprinkle of basil on top will add another healthy element to this vegan lasagne This fragrant herb is packed with manganese, calcium, vitamin A, K and iron. When it comes to serving this vegan tomato lasagne, don’t forget fresh basil leaves. Cut them up or tear them apart to reveal the tantalising scent before scattering them on top. Don’t forget to sprinkle your lasagne with a generous tablespoon of nutritional yeast! This will add a rich, nutty taste, as well as provide some extra B12! Heat up 1 teaspoon of olive oil in a large non-stick pan. Fry onions and garlic for 10 minutes on medium heat. Cut tomatoes into very small cubes, add to the pan. Fry for 5 minutes, then add tomato passata (1 cup) and water (1/2) cup. Fry gently for additional 10-15 minutes. Add a vegetable stock cube, garlic powder and a sprinkle of turmeric. Slowly add almond milk to a mixture of cornflour, nutritional yeast, salt, garlic powder and pepper. Make sure to add the water slowly and keep stirring vigorously to avoid any clumps. Slowly heat up on low heat until you’re left with a perfectly creamy, thick white sauce. If sauce is too thick, slowly add liquid (water or almond milk). Pre-heat the oven to 180°C (fan oven). Use a deep baking tray to assemble your lasagne. Start with a layer of red sauce. Gently place a layer of lasagne sheets on top. 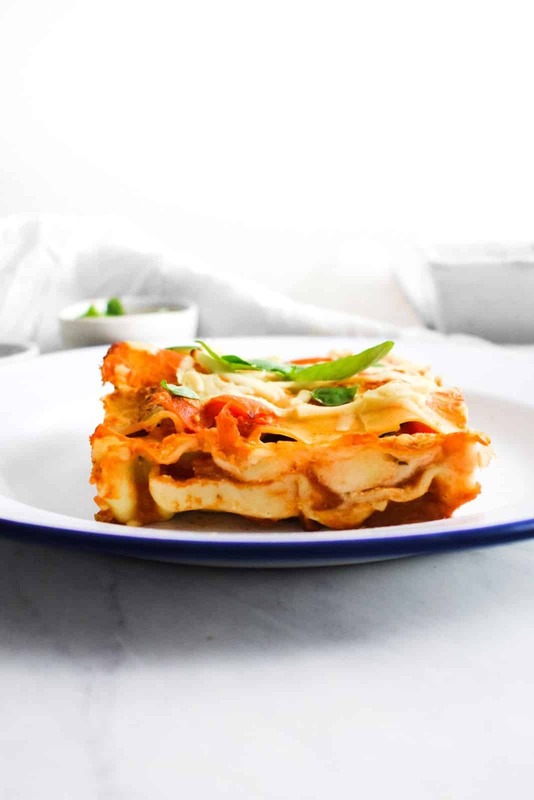 If you are using dry (not fresh) lasagne sheets, make sure to cover every single lasagne sheet in PLENTY of liquid or it will not cook properly. Serve with fresh basil leaves and a generous sprinkle of nutritional yeast. *Alternatively, feel free to assemble the sheets according to your own preference.